RE: Revelations takes place in the events between RE4 and RE5. 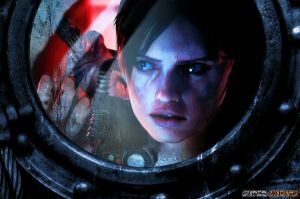 Jill and Parker, Bioterrorism Security Assessment Alliance (BSAA) agents, were sent to the drifting luxury liner, the SS Queen Zenobia to search for Chris Redfield and his partner, Jessica Sherawat after they lost contact to them team. Little do they know that within the narrow and dark corridors of the ship lurks a new breed of evil that will test their mettle and survival. This installment of the game returns to the survival horror essence of gameplay, focusing mainly on limited supplies and puzzle solving. Veteran players will enjoy the game's classic setting (unable to move while shooting) while new players will comfortable with the “shooter” setting that allows them to move while firing. The game also introduces a new tool called Genesis, which allows them to scan enemies or find hidden items in every nook and cranny of the ship. Supplies are very limited so it is imperative to stop and scan every corner for those extra supplies. This guide will feature a detailed walkthrough to help you survive the unforgiving halls of the SS Queen Zenobia. A Handprints locations guide and Trophy Guide will be included as well.